We're just about a week and a half from the official announcement of the Motorola Moto X, and we've already seen leaked press shots of the device, as well as a leaked promo video from Rogers Wireless. As for the insides of the device, we have had a fairly clear picture of what to expect for a couple months now; but, new benchmarks confirm our original source. 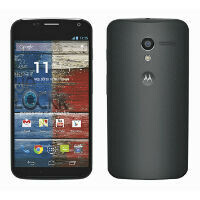 The pics show a Moto X, codename Ghost and model XT1058, which means it is the AT&T variant of the device. As we've expected for a while, the benchmarks and diagnostics show what we've expected from the device including: a dual-core Qualcomm Snapdragon S4 Pro (model MSM8960DT) clocked at 1.7GHz CPU with an Adreno 320 GPU, 2GB of RAM, a 4.7" display at 720 x 1184 resolution, a 2.1MP front camera, a 10.5MP rear camera, 802.11ac Wi-Fi, NFC, and Android 4.2.2. It also shows 16GB of storage of which about 12GB is available, and a 2200mAh battery. As for the benchmarks themselves, the Moto X scored 18,753 on AnTuTu, and 7,143 on 3DMark Ice Storm Extreme. We have been expecting the Moto X to come in with less than top of the line specs, and benchmarks; the difference will be in if the Moto X can provide the top of the line experience. Look at SDcard benchmark numbers... Freaking high! Asus, try to learn and stop using stupid NAND flash! SD card scores caught my eye too...I ran antutu twice on my phone to compare...write- 19.7 MB/s, read- 23.2 MB/s If its kernel support swap partition...this thing will fly!!! The point. You're missing it. The comment. Right over your head. The. Use. Of. Periods. Too. Much. look at that unexpected-2200mAh battery? Motorola srsly? Leak press render looks like 1080 Full HD resolution screen check the icons are small & screen graphics r good compare it to prototype i think these specs is from prototype and can't be real i think real phone have different story wait for the announcement!" Anyone hear anything on it's screen tech yet? not if the price is low. If it cost $300-$400 unlocked its all good. sometimes they do. This one will probably have once since it will use the on screen notification thingy that the rogers video showed. Good point. I hope it's not pentile. There is no such thing as non-Pentile OLED HD for phones. From the pics it looks AMOLED. The specs aren't too shabby... Looks like it'll get the job done and then some. Nice device, but I expected more. Seems moto's launching behind some other android flagships, specs wise. I kinda figured at least 1080p, quad core, 13 mp camera. I don't think it needs those to be an excellent device though, it's got plenty power. Proper software/hardware/features optimization, and camera will be what actually matters. Yup, there's a flagship with all those specs right there, lol. But this thing is not to be ignored...the right amount of hardware-software optimization could lead it to become a better performing device. +1 the specs comment was simply because its an android/moto thing. Moto touts its specs, we all know that. Hopefully they'll showcase the practibility and usefulness of it like Samsung now does, mottos been known for showcasing specs, this could be a welcome departure from that. That's one thing that helps apple sell a lot...proper marketing of everyday usefulness. "...5'+..." 5 feet? Because that would be awesome! Yeah...the Motoboard right? Lol. Come on old man, you know what i'm talking about. It's not trying to be a flagship though... It has wonderful mid grade specs. This would be a great second phone for me to have for work though. This isn't meant to be their flagship though. It's supposed to be a very practical mid range device that is available on many carriers and on Google Play for a low price. Look for the Droid Ultra if you want to see a Motorola flagship.